ST. GEORGE — A motorcyclist was injured after she lost control of the bike she was riding and slid across five lanes of traffic Saturday evening. St. George Police responded to the incident at the intersection of Bluff Street and Sunset Boulevard at approximately 5:15 p.m. The rider, a woman in her early 20s, was eastbound on Sunset Boulevard turning south onto Bluff Street when the wipeout occurred. “She told me she misjudged the curve – that it was tighter than she thought – and she lost control and actually slid across five lanes,” St. George Police Officer Ken Childs said. 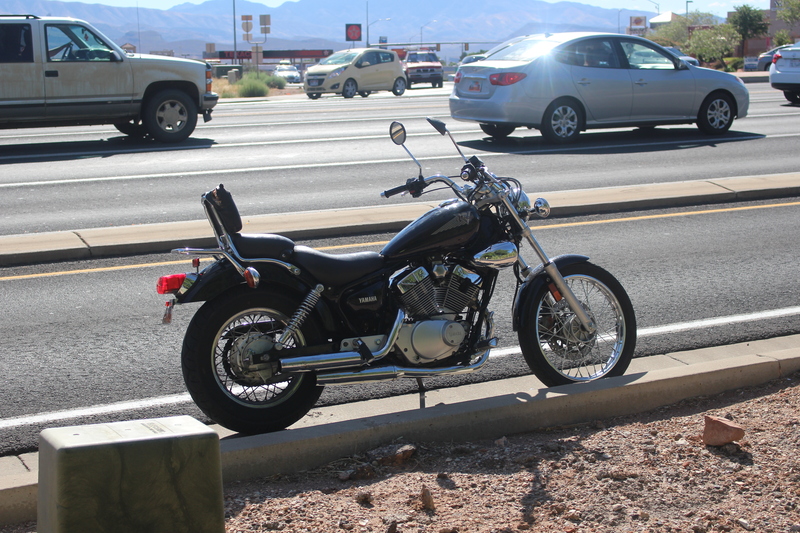 The motorcycle came to rest against a concrete median barrier where the woman landed. She was later brought to the hospital for treatment. The woman was not wearing a helmet and was not in possession of a license. Several witnesses stopped to help and provide police with statements. One witness moved the motorcycle out of the roadway following the crash. What are the odds that someone operating a m/c in such an irresponsible manner, at such a busy intersection, would walk away from this..? This newspaper provides an excellent record of the numerous m/c accidents that occur in SW Washington County, and typically the rider suffers life threatening injuries, or in some cases the lack of safety gear results in death. How stupid, no helmet or gear, use girls all the time in tank tops and flip flops trying to red a tan and riding cycles.. She was lucky,that’s a busy intersection. Good points, Bob. Even a SmartCar is going to win a one-on-one engagement with a motorcycle, and it doesn’t matter which party was at fault – the motorcyclist always loses.